As I mentioned in my previous post, there was no way I was ever going to make it all through the night reading for the Read-A-Thon, so instead of participating I have spent all day visiting the blogs of the people who were actually reading and trying to cheer them on. Let me tell you, there were a lot of blogs on that list! I think I made it around to everyone who is participating at least once. Sorry if I missed you. It definitely wasn't intentional. Because I don't have enough feeds in my Bloglines account, I also found several more interesting looking blogs to my feed reader, but at least I am all caught up to with the feeds I did have - for now at least. It's just a case of staying caught up! In case you were wondering about how I went with the soccer game last night, the answer is not that great! I missed the first ten minutes because I just wanted to read the end of the current chapter in the book I was reading. Then I moved into the lounge to watch the soccer and fell asleep after about ten minutes. I woke up at the end but by that time I had missed all of the five goals that were scored in the game! Whoops! Marg: I can't believe it! I'm a lover of cozy mysteries too, but I couldn't find a book on your list that we have both reviewed! I've read lots of Elizabeth Peters' books but not reviewed them, so those don't count. Please visit www.bookbirddog.blogspot.com and hope you will like some of the mysteries I reviewed. They are not listed in any order, by the way, but my favorites are gardening mysteries, birding mysteries, and other mystery series with a theme. You are certainly an avid reader!!! So many books read! Congrats! Love this blog! Haven't quite caught up with it all yet but feel very much at home here. Thank God blogger chooses to highlight blogs of note otherwise gems like this would be completely lost to mere mortals such as myself. Bookbirddog, I haven't been reading as many cozy mysteries as I used to, but I am definitely adding your blog to my reader so that I can check out what you are reading and get some more ideas! Thanks boxofficegirl! Pull up a chair , have a look around! 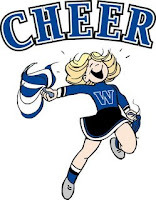 You are an awesome cheerleader! Thank you for the many visits and have a BEAUTIFUL DAY! It's my night time here, so I am going to bed now! I need some rest after all that cheering! LOL! Hi. I just wanted to let you know that I enjoyed your blog. I too have a love for reading. Very nice blog. I was checking it out in order to start one of my own. Want To See The Best Phone From Nokia?!?! Games, Software And More Interesting Things! Nice job cheerleading as well, I saw you on a lot of the blogs I visited. It was hard to visit everyone, but I think all the cheerleaders combined did a great job! Congratulations for your beautiful and well organized blog! Really good! Keep doing it! hey, nice blog. congratualations on being featured on blog of note! Congratulations, and not only for being Blog of Note, but your excellent taste for books! I do love crime and mysteries, I'm fond of reading anyway, and, being an author, always glad to find another book lover! Just have to say I love your blog! So glad I found you on Blogs Of Note! I'm an avid reader and use books as my escape as well! Haven't read all the stuff you have, but I will now after your reviews :) I also love your Tueday Teasers such an awesome idea!! Keep up the good work! just stumbled upon your blog. love the content so far. Missed the read-a-thon hope to catch the next one. Nice blog. . . . .
About books n reading. . .
Congratulation to u'r blog to be blogs of note. . .
Agree! What luck - I just happened to see this one under the 'blogs of note' and I am hugely impressed! I run a small book review blog in South Africa but this is a damn classy blog. Definately one I am adding a link to. Hi and congrats on your blogs of note, thing. You have some great books on your space. I am a bibliophile too although I tend more towards poetry and international literature. Great blog .. love your writing style. Congrats on being "blog of note". I'll have to return and spend some time here ... there's so much to take in. wonderful blog. I'm glad they picked you. What a hidden resource you are. I love your blog! I hate I missed the Read-A-Thon. You have much on your site that I want to meander through and take note of. I have subscribed to your blog and will be back. Thanks so much for the effort you but into your blog and sharing with us.